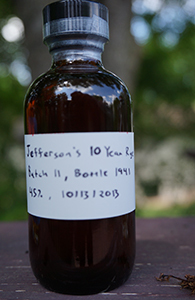 Sku, the source of my sample, reviewed this bourbon on Monday. He’s forgotten more about bourbon than I know but I’m going to follow his review anyway. If nothing else, I will give you more than the four nouns and two adjectives that Sku shared with us (he’s not paid by the word there). This is a 100% rye from an unnamed Canadian source. This source is thought by many to be Alberta Distillers, who are also the source of the similarly 100% rye bottled as Whistlepig in Vermont. This is at a lower proof at 45%. I have now exhausted my knowledge on the subject, so let’s get straight to the review.